Worldwide population growth, continued geopolitical conflict in oil-producing regions, volatile energy prices, and heightened concerns of climate change are fueling demands for energy efficiency—specifically for products that can cut energy consumption and costs, reduce dependence on oil, and reduce emissions of carbon dioxide and other harmful greenhouse gases. According to Inc. Magazine, commercial and residential buildings account for nearly 40% of energy used in the U.S., with an estimated 52% of CO2 emissions tied specifically to the built environment. Thus, “greening up” the U.S.’s buildings, roads, and other infrastructure represents a big challenge and, concurrently, a big opportunity going forward. In parallel with a global movement toward more energy-efficient, sustainable products, much of the infrastructure in the U.S. is reaching the end of its lifecycle, necessitating either repair or new, improved construction. These needs for both greening up U.S. infrastructure as well as for retrofitting the existing built environment are being achieved through nanotechnology, which is shaping up to become a driving force for innovation and sustainability in the 21st century and beyond. Nanotechnology enables new approaches to solving many of today’s social, economic, environmental, and infrastructure concerns, and in doing so, is changing the landscape of virtually every aspect of the built environment. 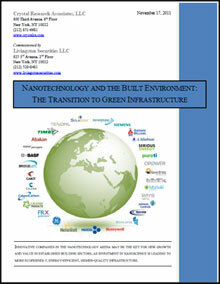 The potential benefits of energy-saving, ecofriendly, nano-based materials are considerable. Fueled by an array of such startups and new technologies, the global market for green building materials to date has become a $156 billion industry per year. 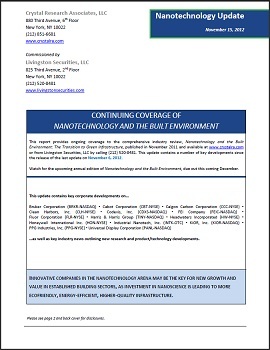 Our first edition base report, Nanotechnology & the Built Environment: the Transition to Green Infrastructure, is a 76-page, comprehensive report on the impact of advanced materials on the infrastructure markets. Over 100 companies, research institutions, and key investors are included.